Spanish Foreign Affairs minister José Manuel García has hailed the cooperation ties existing between security services of Morocco, Spain and France, saying this triangular cooperation is currently unmatched, the best-ever and the closest in history. Spain cooperates in this field with its neighboring countries, added the top Spanish diplomat, noting that his country is part of the international coalition against Islamic extremists. Moroccan and Spanish counterterrorism services have joint efforts to foil terror plots and save lives. They have conducted many joint operations that led to the arrest of suspects recruiting fighters for the Islamic State terrorist group. Last March, Moroccan Interior Minister Mohamed Hassad and Head of Morocco’s internal intelligence service Abdellatif Hammouchi, who is also Chief of General Directorate of National Security (DGSN), visited Spain wherein the two top security Moroccan officials met with Spanish Interior minister Jorge Fernandez Diaz and Security Secretary of State Martinez Fransico. On this occasion, the Moroccan and Spanish officials praised the “excellent and exemplary cooperation ties” existing between the security services of the two countries thanks to the friendship binding King Mohammed VI and King Felipe VI. In a joint statement released after the meeting, the two countries delegations expressed “great satisfaction” at the efficiency and positive results reached at the operational level particularly in the fight against terrorism and organized crime. 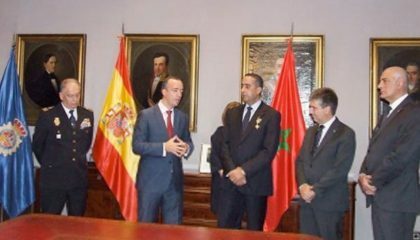 Regarding the fight against terrorism, the Moroccan and Spanish top security officials hailed the bilateral cooperation based on a sound sustained intelligence exchange and joint operations that led to the dismantling of many terrorist cells, including those that recruit and send foreign terrorist fighters to “hotbeds of tension”. They also reviewed the efforts made in the fight against drug trafficking, underscoring the efficiency of the measures that helped to reduce drastically drug trafficking activities using small planes over the Strait of Gibraltar. Sabah Lebbar is the former head of english desk at Maghreb Arabe Press , and she has been the Moroccan news agency correspondent in Washington D.C for several years. She is a well-known and respected Senior correspondant/journalist in the Arab World and the US, and has done extensive interviews and coverage of US elections and major events throughout the globe . She is the Editor in Chief of North Africa Post since the beginning of the project in 2012.